There were no boats today as there was northerly winds and even a weather warning from the coast guards. 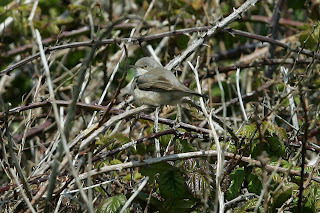 The weather was however fairly sunny and on a walk to count a gull colony a friend from Norfolk (Jamie Boulter) and myself managed to spot this lovely female Subalpine Warbler in the brambles and bluebells in South Stream. 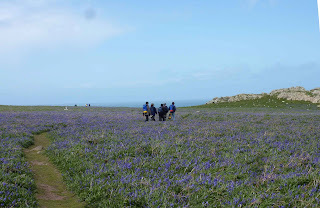 Following the small heat wave here yesterday which saw three hundred day trippers coming over to enjoy the birds and bluebells, we awoke this morning to another wet and blustery day and the need for boots and waterproofs again. Winds of 35 knots and above are producing spectacular seas around the island, but mean unfortunately that day trips are not possible today. Despite the poor weather, there is still plenty to do to keep the island running smoothly. We’re having a bash at a couple of indoor practical tasks, ably assisted by yet another set of hard working and talented short term volunteers. Last week’s volunteers left us on Saturday, and we’d like to thank them for all their efforts and DIY work around the buildings during the windy weather; all your work and enthusiasm to get stuck in was much appreciated. 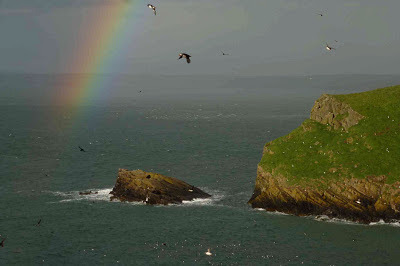 Wet and windy weather today means great conditions for seeing Manx Shearwaters at their most spectacular. Those braving the elements have been rewarded with impressive sights of thousands of these beautiful birds “shearing” over the waves offshore from the island. It’s very exciting and thoroughly enjoyable to be out there enjoying such a magnificent sight. 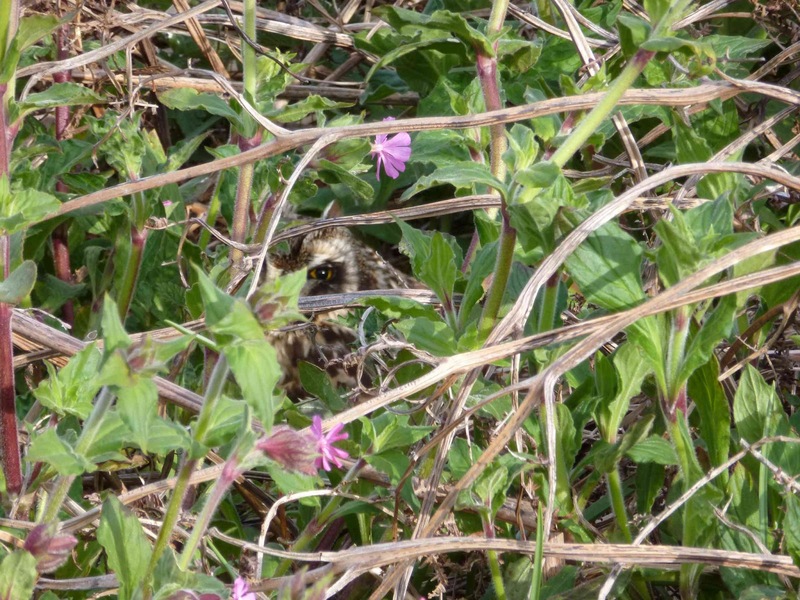 Surely there must be some other interesting birds out there as well… maybe even some Skuas? Must have another look this afternoon! 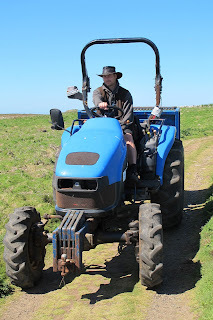 Important practical island news is that our trusty New Holland tractor is now back up and running. All staff and volunteers are greatly relieved, as although we started the season enjoying the challenge, the novelty of using wheelbarrows was starting to wear a bit thin! We look forward to meeting all visitors from now on with the tractor. A couple of weeks ago, the afternoon was drawing to a close and we were preparing to see the last day visitors safely off the island, when a beautiful sailing vessel entered North Haven under sail and anchored over near Rye Rocks. 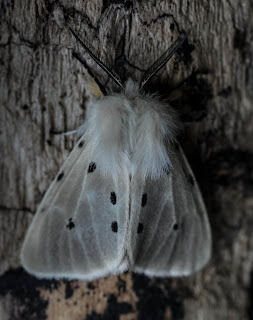 The crew came ashore for a look around the island, and through talking to them and doing some research online it came to light what an amazing life she has had. 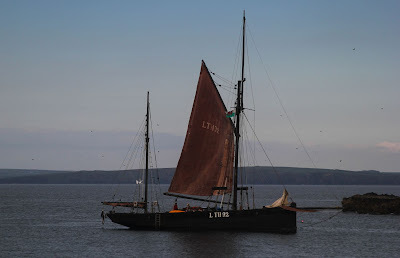 Named “Keewaydin”, registered in Lowestoft with the registration of LT1192, she was built in Rye as a Herring Drifter in 1913 (one of the last few sailing trawlers built at a time when steam drifters were taking over from sail), making her one-hundred years old this year. She fished the North Sea until 1937 when she went to the Baltic to transport cargo. She served in both World Wars, carrying refugees from Denmark to neutral Sweden, and in one trip carried a total of 420 commandos. She was converted to a yacht in 1963, and in 1972 she completed a full globe circumnavigation in the first Whitbread Round The World Race. She was rescued from Malta by the Welch family in 1997, sailed to Brixham and underwent extensive refurbishment. 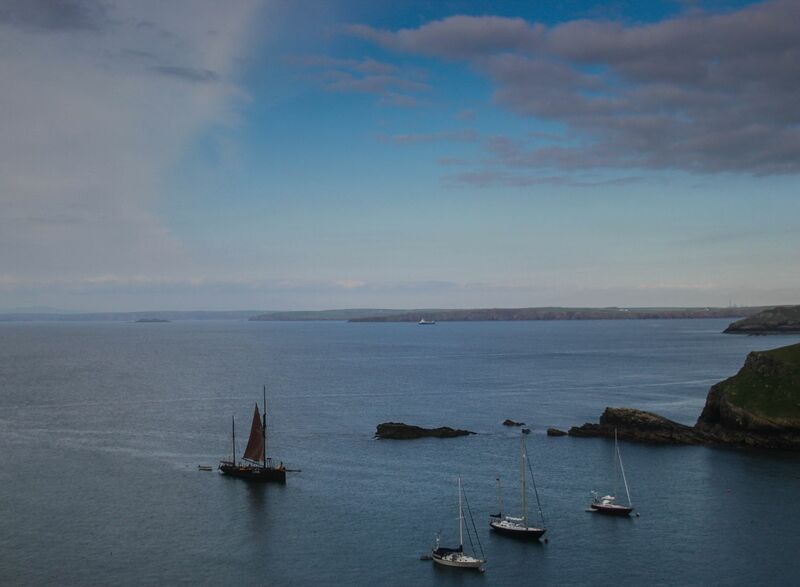 She now sails out of Falmouth offering people the chance to experience life at sea on a traditional vessel. Yet another example showing what a tremendous place Skomer Island is, as you never know what to expect, but guaranteed there will be something of interest or beauty to enjoy. We look forward to welcoming all guests and day visitors as soon as the wind eases. Life on an island is sometimes rough: Walking up and down fields in zigzag counting gull nests all day long is rather exhausting and repetitive, wheel borrowing luggage to and from the farm is quite tiring (our tractor is still wheelless, see picture) and having to eat the same old stuff for days because you have run out of fresh food is a bit awkward. 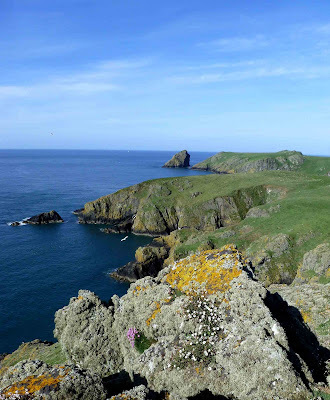 But there is a big B U T. The island is looking absolutely amazing at the moment - the blue bells, white campion and thrift are flowering, the puffins are whirling in the evenings, and once in a while a nice migrant pops up or you get a glimpse of a very well camouflaged breeding bird . 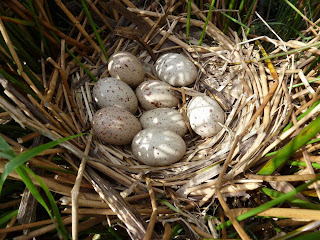 By the way, have you guessed what nest they were? 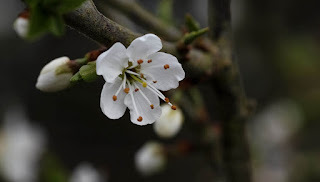 Insects have started to emerge and the slowly rising temperatures have led to more bees and flies flitting between the flowers. And last but not least the Short Eared Owls have been doing well compared to last year. 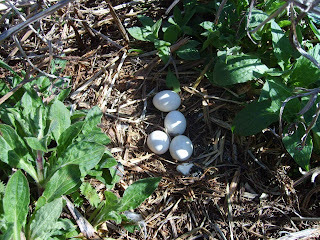 We think we have at least three pairs and have come across one nest which has three healthy chicks in at the moment. 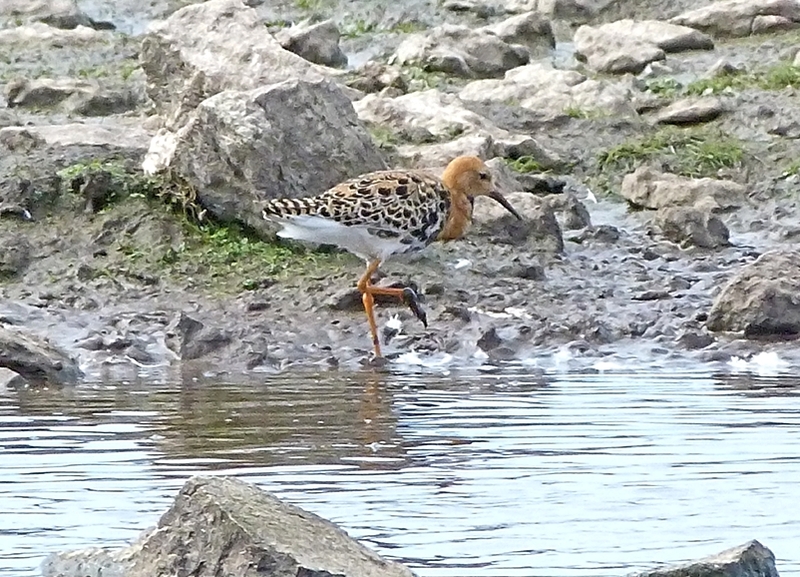 The adults are out busy hunting most evenings, giving some great views to the overnight guests. 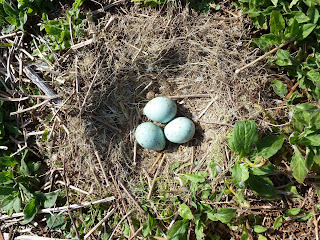 How exhausting can it be to walk around lovely countryside and count some gull nests. I can tell you this: It is massively exhausting. 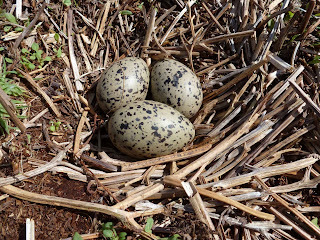 We have been going up and down Skomer all day long from 8 in the morning till 6 in the evening, our eyes peeled on the ground not to miss a single nest. 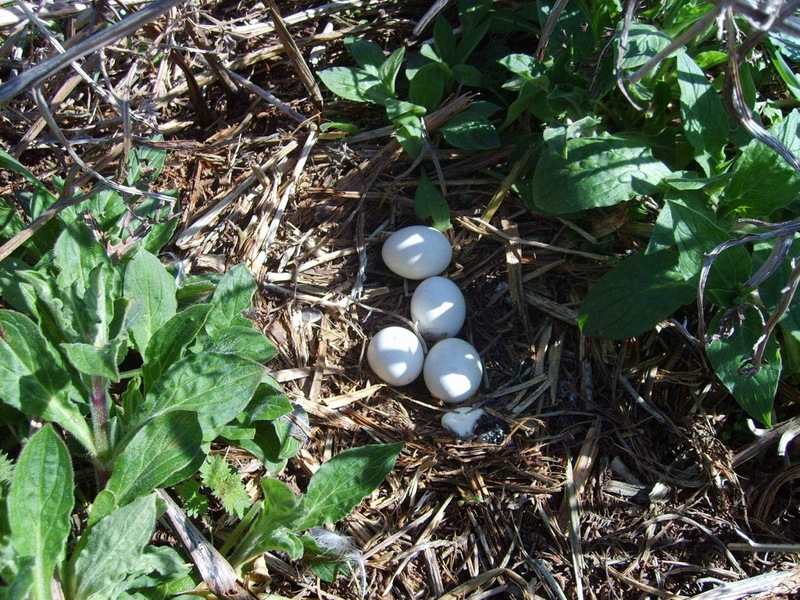 So far we have counted 1006 Lesser Black-backed Gull nests and we have come across some other nests too! Have a look at the pictures below and see whether you can guess what other nests we found. 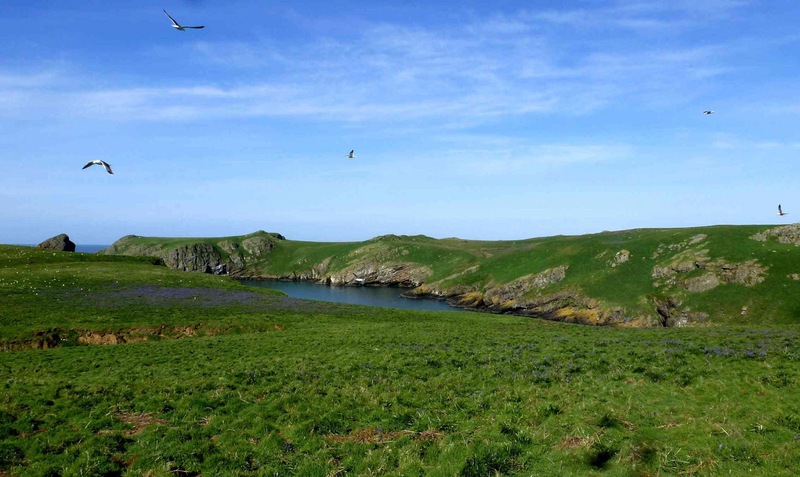 We still have got several study plots to count and the island will be closed to visitors till we are finished (latest on Thursday evening). 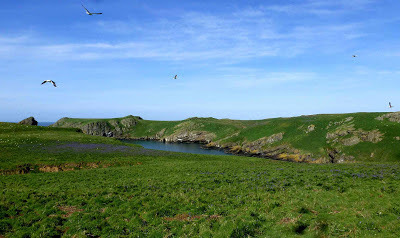 If we are done earlier we will reopen Skomer, so keep an eye on the blog and twitter. As my eyes sting and my feet hurt I will not write anymore but have a relaxing evening and leave you with my little quizz. As I am writing this, the rain and gusts of 56mph are battering the farm buildings and are creating an eerie whistling throughout the hostel. 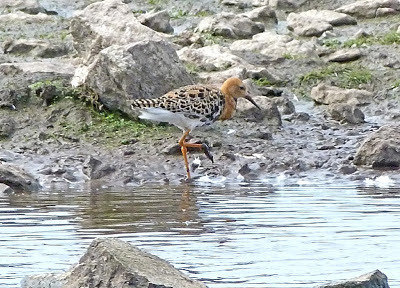 After a busy and sunny bank holiday, with a yearly record of 250 visitors on Sunday, it seemed that finally spring was upon us. 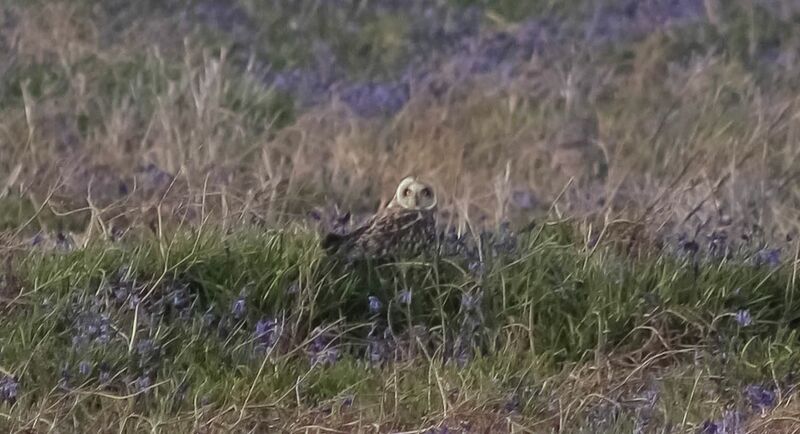 Sedge warblers, Whitethroats and Wheatears have been out in numbers and Short Eared Owls have been seen regularly hunting around the island. 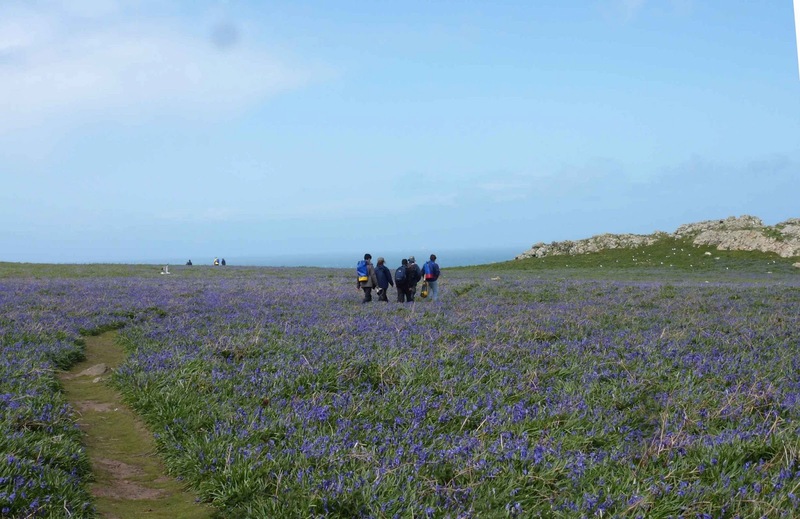 The Bluebells and Campion have begun to come into bloom and the first Guillemot, Razorbill and Lesser Black-backed Gulls eggs have been seen. However, it appears spring has been put on hold as strong winds and wet weather have been forecast for the coming days. In the last week, the fine weather gave me and Dave Boyle the opportunity to get some good evenings of moth trapping done. 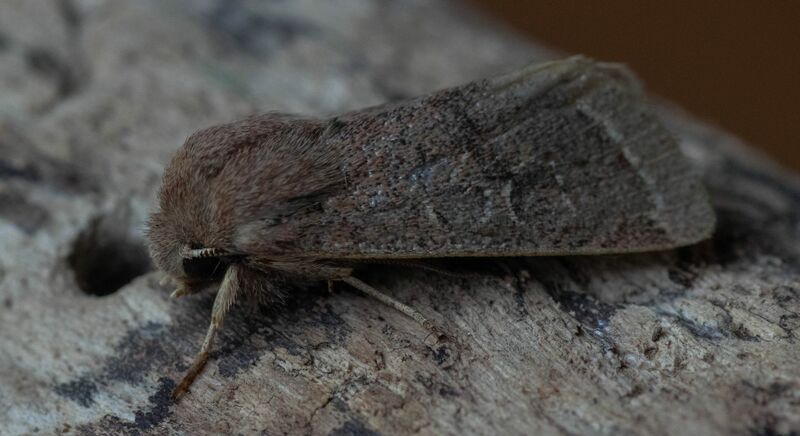 I am currently carrying out some research for my undergraduate dissertation comparing the moth populations in heathland areas with bracken dominated areas. The good weather has also given us lots of opportunities for sea watches, with porpoise frequently seen feeding around the coasts. 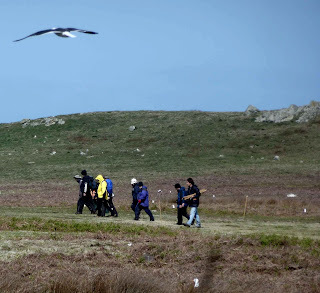 The island will be closed for day visitor for the annual gull count between Monday (13th) and Thursday (16th) next week. We will update you soon with how that goes. 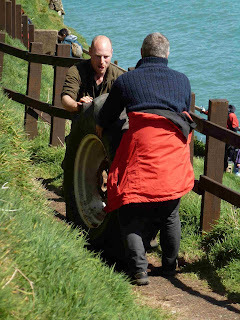 The tractor is also still in the process of being fixed, with the rear wheels removed and rolled down the landing steps to be taken to the mainland. So we will be wheelbarrowing luggage and food up and down to the farm for the next couple of weeks. 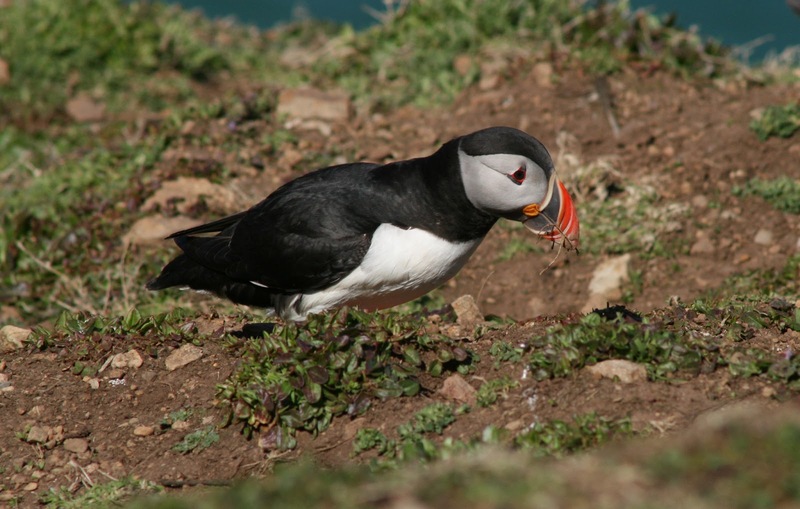 Now that we are in to May we are making our last Puffin counts before numbers drop considerably as birds go down on eggs. 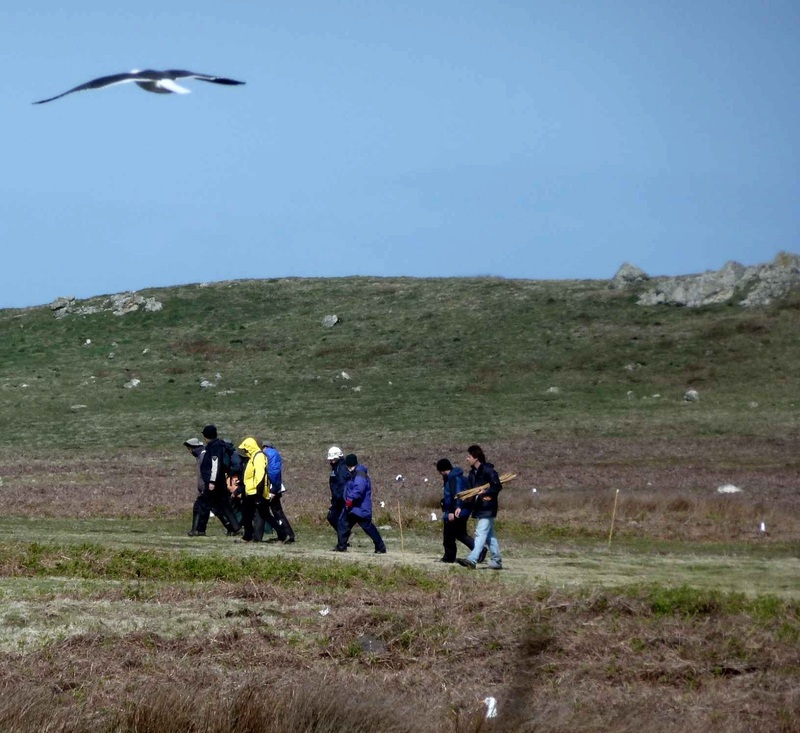 Our first count on the 20th of April saw a peak in numbers with over 19,000 birds counted. The next count on the 25th was still relatively high at 17,228 and our third count dropped yet again to 12,803. The first egg was found by researchers from Oxford university on the 1st of May using a burrow scope. 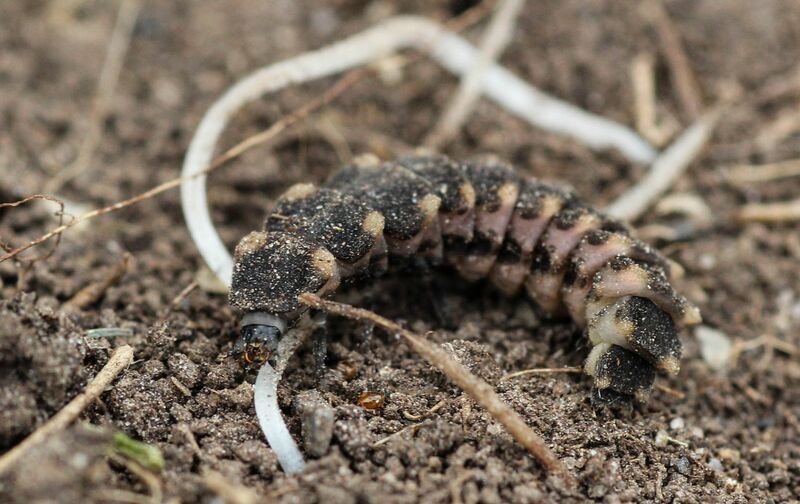 Researchers from Oxford are also looking at survival rates, burrow occupancy and reproductive success. For this they are colour ringing a number of birds and resighting them each year. 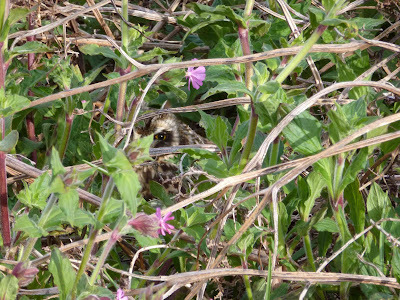 Can you spot the colour ringed bird in the photo below? There has also recently been a paper published on the at-sea behaviour of the Skomer Manx Shearwaters during their migration and in the winter. 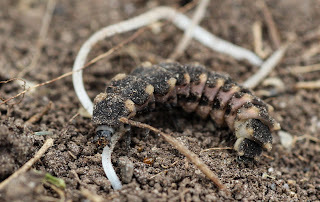 For more imormation see this link. 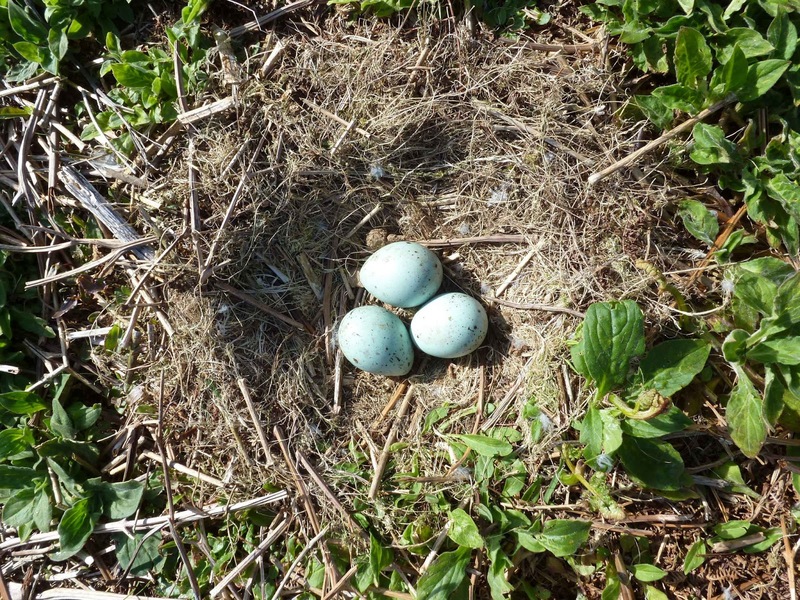 Other Skomer birds have started nest building and the first Wheatear and Meadow Pipit nests have been found. 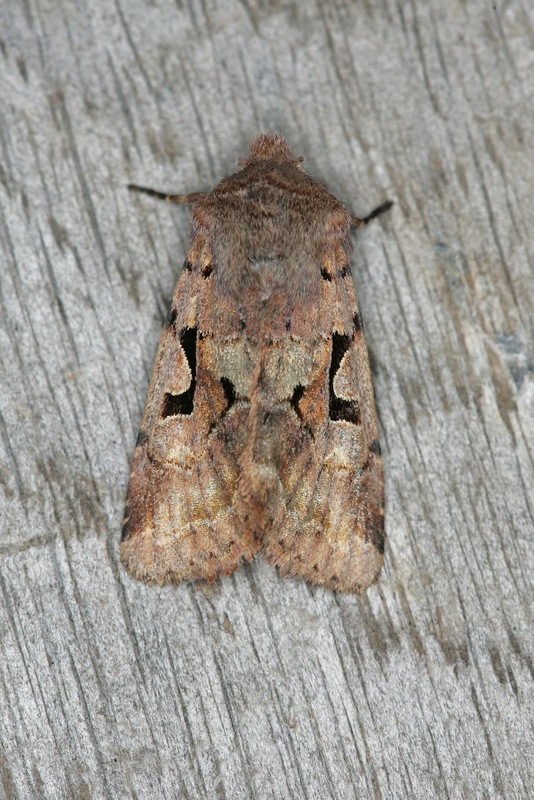 Spring is definitely now in the air and there is a flush of growth and colour which was sadly lacking until now. 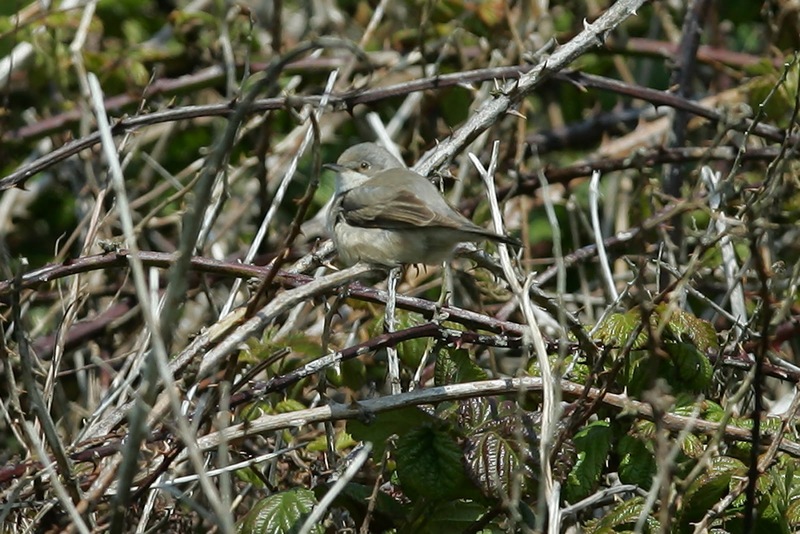 Migrants are pushing through with the majority being Sedge Warblers, Common Whitethroats, Willow Warblers, Blackcaps and Chiffchaffs. The Pallid and Montagu's Harriers both enjoyed there last day on Skomer, using the warm bright day to find uplifting thermals and continue their amazing journeys (the former actually seen circling upwards and gliding off to the north at 09.45). In other news; please be aware that if you are coming to stay on Skomer over the coming weeks, the tractor is still broken and lugguge needs to be carried and pushed in wheelbarrows up to the accommodation at the old farm. We will keep you updated on this but for now pack lightly.